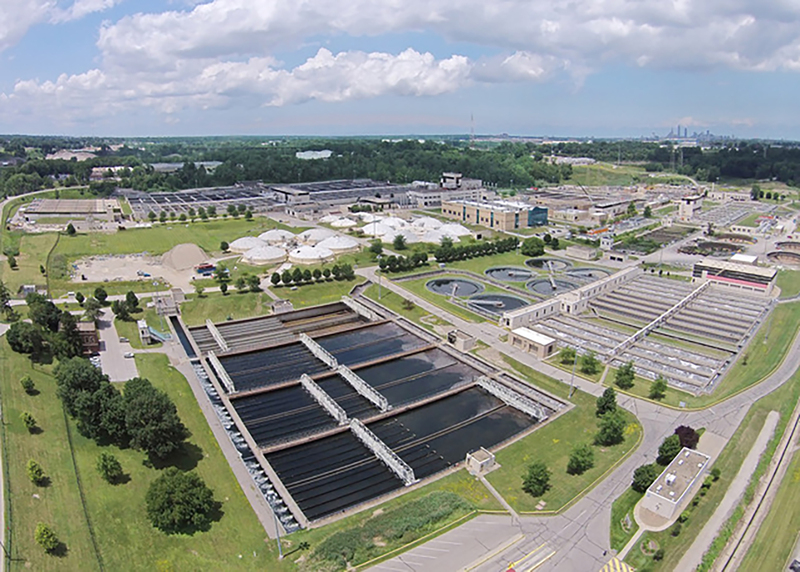 The Northeast Ohio Regional Sewer District (NEORSD) Southerly Wastewater Treatment Plant in the Greater Cleveland area is the recent recipient of the Envision® Silver award for sustainable infrastructure from the Institute for Sustainable Infrastructure (ISI). Typically applied at the planning and design stages of infrastructure development, the Envision system rates infrastructure projects across the full range of environmental, social, and economic impacts. For the NEORSD Southerly Plant, a pilot initiative was undertaken in which Envision verification was pursued well into the plant’s operational life, making this the oldest infrastructure project that has been verified by the Envision sustainable infrastructure rating system. The original NEORSD Southerly Plant became operational in 1928, and underwent a major rehabilitation of in 1974 with investments of $400 million. More recently, the construction of a Renewable Energy Facility (REF) at the Southerly Plant became fully operational in 2014 and the construction of the REF facility was a key driver to pursuing Envision verification for the facility. The NEORSD Southerly Plant is located in the Village of Cuyahoga Heights, Ohio on a 288-acre site and it serves a population of more than 530,000 in the Greater Cleveland area. The Southerly Plant is the largest of the district’s three wastewater treatment plants and is among the largest of its kind in the United States, handling an average daily flow of 120 million gallons per day (mgd). As the operator of the facility, the Northeast Ohio Regional Sewer District collaborated closely with The Construction Green Team on the Envision sustainable infrastructure project submission for the facility. Economic Growth and Development: NEORSD creates approximately 70% of the employment in Cuyahoga Heights. Approximately 200 people work at the Southerly Plant and the employees have many opportunities to advance their careers through training and education. The organization also has a college tuition assistance program in place, and offers training programs, such as maintenance and operator training programs. NEORSD has earned The Plain Dealer/Cleveland.com Top Work Places and NorthCoast 99 Great Workplace awards in recognition of its contribution to economic growth in the communities it serves through its hiring practices and support of its employees. Development of Local Skills and Capabilities: Educational opportunities are expanded to other stakeholders in Cuyahoga Heights and beyond through NEORSD’s offers of introductory level workshops designed for Northeast Ohioans interested in learning more about the history and future of sewer systems, water quality, and sustainability in the region. These workshops are attended by a range of stakeholders including customers, public officials, community groups and school groups. Long-Term Monitoring and Maintenance: The NEORSD Southerly Plant has been operational for decades with a well-established history of undergoing upgrades and rehabilitations over time to continue to meet the needs of the community it serves, as well as to continue to comply with stricter water treatment standards. Energy Reduction: The recently completed REF at the Southerly Plant provides further evidence of the NEORSD’s leadership. The REF uses sludge, septage, and grease from both the Southerly and Easterly plants to generate energy. The construction of the REF, along with the decommissioning of the Southerly Plant’s Biosolids Thermal Conditioning System, contributes to a reduction in natural gas usage by approximately 137,000 mcf per year.